Any book lover knows that it’s impossible to own just one book. This means your home is probably filled with all of the books you’ve read over the years, along with many you are planning to read. 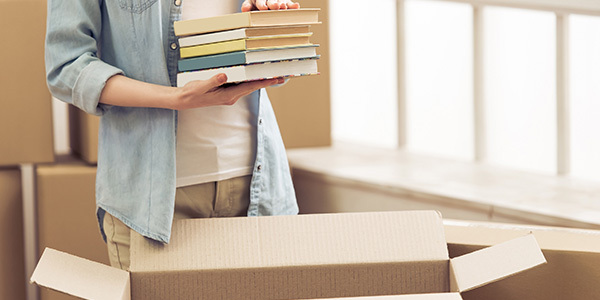 Whether you are looking to move into a new home or just trying to free up some space, you will need to know the best way to pack books to avoid damaging them. 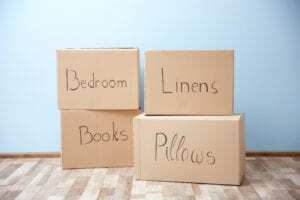 In this blog, we’ll go over the best packing boxes for books, how to label them, and how to pack books to avoid moisture, pests, and further damage. If you are planning to store your books, especially long-term, you will need to know what steps to take to keep them in perfect condition. Without further ado, here are the 10 best tips for packing books. Pick out the books you’ve already read or no longer have interest in and sell them! You can either do this by hosting a yard sale or by selling them on sites like eBay and Amazon. 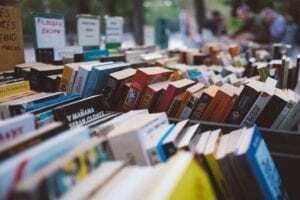 If you don’t want to go through the hassle of selling your books, you can donate them to your local library. You can also start a “free library” in your local neighborhood, and put your books there to share with others. If you have a friend who loves books as much as you do, offer to trade with them! Give them all the books you are looking to get rid of in exchange for one or two of their top picks. This way, you know your books are going to someone who will enjoy them. Plus, you get a few good reads in exchange! The final option is to donate your books to a nonprofit organization. This could be somewhere like Goodwill, or possibly your local women’s shelter. This is a simple way to give back to your community, and you can get a small tax write-off for your donation. The next step is to sort and separate your books by category. We suggest dividing them by genre or author. When packing your boxes, load them by category, and be sure to label each box accordingly. This will help while unpacking, as you will know where books are located instead of having to guess. If you are storing books as a long-term storage solution, you will want to know where certain books are when you are ready to read them. If you need to get more specific than labels, make an inventory. Write down each book that you place into the box, then tape that inventory to the outside for easy access. 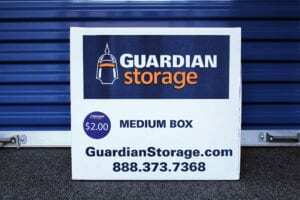 You may want to make a copy to keep with you so that you know which box to look for when you access your storage unit. When choosing packing boxes for books, you have two options. This option is the most cost-effective for packing books, and will generally keep them in good condition. You should never choose anything larger than a medium box, as it becomes too heavy and more likely to tear through the bottom. Never use damp boxes or move your boxes while it is raining. This makes boxes weak and will cause them to tear and damage your books. It also makes them susceptible to mold and mildew. When packing boxes, make sure to double tape the bottom to ensure that the books will not tear through. Plastic containers are an excellent choice for long-term book storage, as they defend against moisture and other damage. While boxes are fine for most short-term moves, over time they become susceptible to humidity, moisture, and pests. The airtight seal of plastic containers protects from all three of these threats. It also forms a thicker barrier from damage during moving due to other items. The only negative of plastic containers is that they do not allow books to “breathe” as boxes would. If you will not be using storage and are just looking for the best way to pack books for moving, you may decide to pack them into a suitcase. This option allows you to pack a large number of books into one storage option. Due to the durable nature of suitcases, you do not have to worry about them ripping or tearing from the weight of the books. The wheels on the suitcases make it easy to transport all of your books at once. You should be cautious of this decision if you will not be moving right away. Stuffing books into your suitcase can cause them to crease. 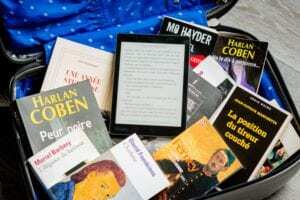 If you do not have a hard shell suitcase, your books will be more susceptible to moisture, as well as damage caused by other items while moving. Once you decide on which box option is best for you, the next step is to properly pack your books. For hardcover books, stand them upright with the spines against the sides of the bin or box. If you are packing soft cover books, you can stack the books flat or use the same method as the hardcover books. For further protection, wrap each book in acid-free packing paper (this prevents yellowing). If you do not have packing paper, place a dry piece of cardboard in between each book. Fill any empty space in the box with bubble wrap or packing paper. This keeps books from moving around and getting damaged during the move. Bugs like silverfish, beetles, and booklice love to burrow in books and feed on them. The first and most important, thing you should do is make sure the company you are storing with has preventative pest control. You should also take your own preventative measures to keep pests out of your books. Mothballs deter bugs, but they smell horrible and the pesticide in them can damage your books. Instead, opt for cedar chips, which are known to deter bugs and pests. You can buy bags of chips or large blocks online. Place them in the containers with your books to deter any lingering bugs. Moisture can be incredibly damaging to books. It causes pages to wrinkle, covers to warp, and binding to come apart. If left exposed for a long period of time, it can lead to mold and mildew and completely ruin your books. You should never move your books in the rain, and if you do, you should revisit later to dry them off and replace the boxes they are in. Always keep boxes with books elevated to avoid moisture from the ground or any flooding that could occur. Keeping books in a low-humidity environment is the best way to avoid moisture damage. You should also avoid any area that experiences temperature extremes, such as an attic. When loading your book boxes into the moving truck or your car, do not stack all of the boxes on top of each other. The boxes containing your books will be heavy, and if tipped over, can cause damage to other items near them. They may also crush boxes underneath from their weight. Spread them out on the bottoms of piles to avoid tipping or crushing. The safest place to store your books is in a climate-controlled, indoor storage unit. Climate-controlled storage maintains a consistent temperature and humidity year-round, providing the perfect environment for your books. Storing indoors is a precaution to avoid natural elements like rain or snow during moving. For further protection, consider adding standing shelving in your unit to keep your books off the ground in case of flooding or pests. While both of these are uncommon occurrences, it is best to protect yourself from all “what if” scenarios. Once you have completed these 10 tips on the best way to pack books, the next step is visiting your local Guardian Storage. Once there, our experienced property manager will show you your options and help you pick the unit that is right for you. Planning to store more than just books? Our blog has tons of great advice and tips for moving and storage. This post doesn't have any comments yet.